Structural elements of ORC, differentially colored by subunits and with the molecular surface highlighted. The ORC 6 subunit is shown in red. Image credit: Franziska Bleichert. Argonne, Ill. ― A clearer understanding of the origin recognition complex (ORC) – a protein complex that directs DNA replication – through its crystal structure offers new insight into fundamental mechanisms of DNA replication initiation. This will also provide insight into how ORC may be compromised in a subset of patients with Meier-Gorlin syndrome, a form of dwarfism in humans. ORC is a six-subunit protein complex that directly binds DNA to recruit other protein factors involved in DNA replication. Researchers collected data at the Advanced Photon Source (APS), a U.S. Department of Energy User Facility based at Argonne National Laboratory, to obtain the first atomic-level resolution picture of this complex. The structure shows that ORC’s main body has five subunits that contain a common fold that is found in proteins binding ATP, a small molecule that cells use as fuel. 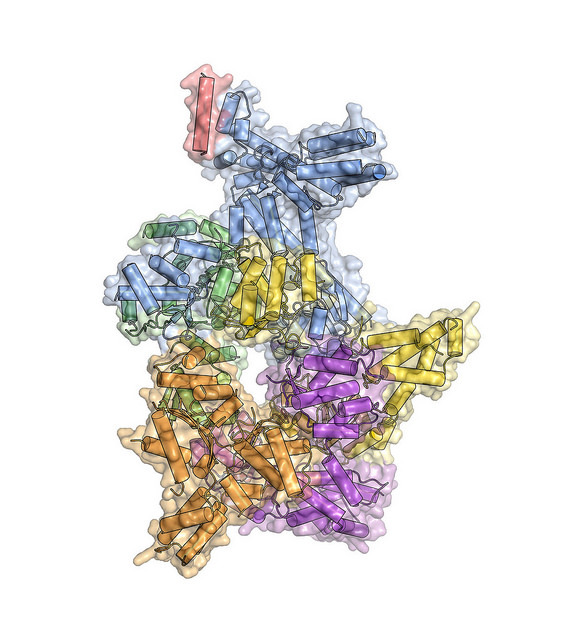 One of the largest subunits, ORC3, has a structural element that protrudes from the ORC core to contact ORC6, according to the paper, ​“Crystal Structure of the Eukaryotic Origin Recognition Complex,” published last week in Nature. The research team was surprised to learn that a region of subunit ORC1, which is biochemically known to interact with a similar region of ORC4, did not do so in its structure. In fact, this region in ORC1 blocks entry into the central channel and prevents DNA binding. This phenomenon suggests that ORC in multi-cellular organisms can adopt a previously unanticipated inactivated state that is likely important to regulating its activity and preventing inappropriate DNA replication. Researchers’ access to the APS was important. ​“The powerful X-ray beam at the APS and the flexible data collection technologies at the General Medical Sciences and National Cancer Institute (GM/CA) beamlines – in particular microfocus capabilities and crystal rastering – were critical in obtaining high-quality datasets that allowed us to determine the structure,” Bleichert said. The research illustrates the importance of understanding the role proteins have in DNA replication, an essential cellular process that needs to be tightly regulated. When deviations in DNA replication occur, cells can end up with fragmented DNA that can lead to cell death and diseases such as cancer. The paper was published online Tuesday in Nature. The paper authors are Bleichert and James Berger, Johns Hopkins University School of Medicine, and Michael Botchan, the University of California (UC), Berkeley. APS beamline 23-ID-B was used for research. The GM/CA beamline at the APS is funded by the National Institutes of Health’s National Institute of General Medical Sciences and the National Cancer Institute. Additional funding came from a fellowship from the UC Berkeley Miller Institute for Basic Research in Science.